A Good showing against the best of Britain. * Ulster Boys TTT 23 seconds behind 1st place Team. Two Teams headed to the Youth Tour of Scotland 2019 from Ulster and arrived at the famous Strathallan school in Perthshire. 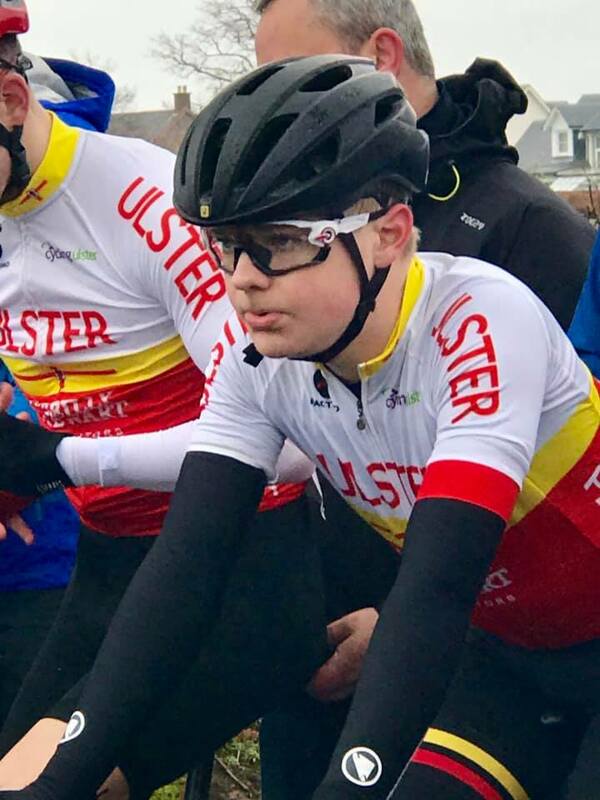 The two 4 rider teams of U16 boys and girls were Odhran Doogan, Somhairle Fisher, Darren Rafferty and Joseph Owens, the girl’s team was Katie Neill, Maria McAllister, Rachel White and Erin Creighton. Looked after by Maurice McAllister, David Creighton, Doreena White and Gary Rafferty. Thank you for the support and help from parents, Brian and Fiona McAllister, Denise Owens, Philip and Nikki Neill, Charlie Fisher and Geraldine Doogan. Stage 1 – (Girls) This was a great experience with the riders getting the opportunity…Professional style….. to ride on completely closed roads (9.00am to 4.30pm) with motorbike outriders and a flotilla of Scottish and British Cycling decorated team cars, neutral service and the safety further compounded by a battalion of marshals on the ground making sure every entry/exit was manned and covered. 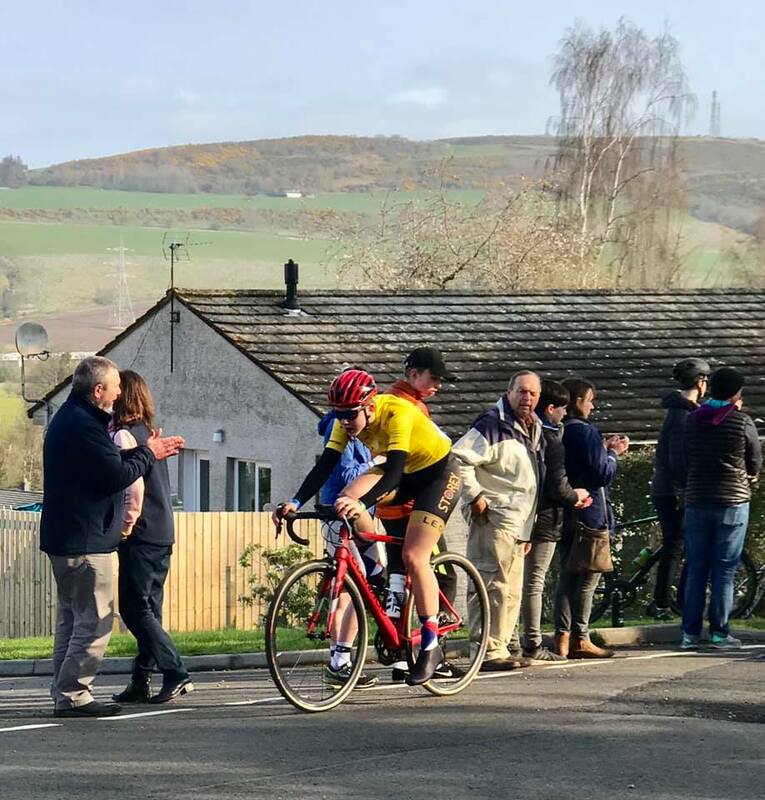 With a professional commentator giving the feedback to the well-crowded village of Forteviot with a rundown blow by blow account of every mile and lap of the racing. An atmosphere of excitement was in the air despite torrential rain and flooding the show went on with what can only be described as excellent racing as the best in Britain and others with aspirations to get the best for their riders, the pace and action was frantic with the first race off for the U16 girls (33km – 20miles). In the girl’s field was Zoe Backstedt, the daughter of Paris Roubaix winner Marcus Backstedt riding for the strong Wales Team. 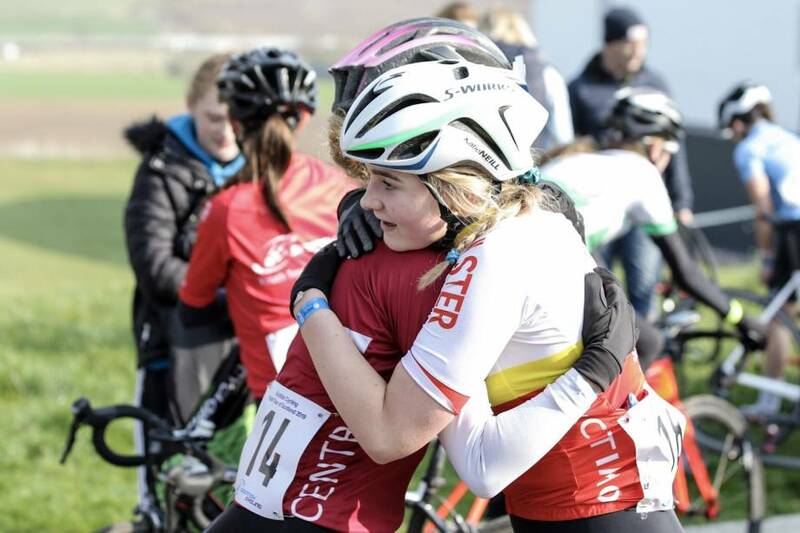 Zoe recently won the U17’s version of the Gent Wevelgem, Zoe is only 14 years old. 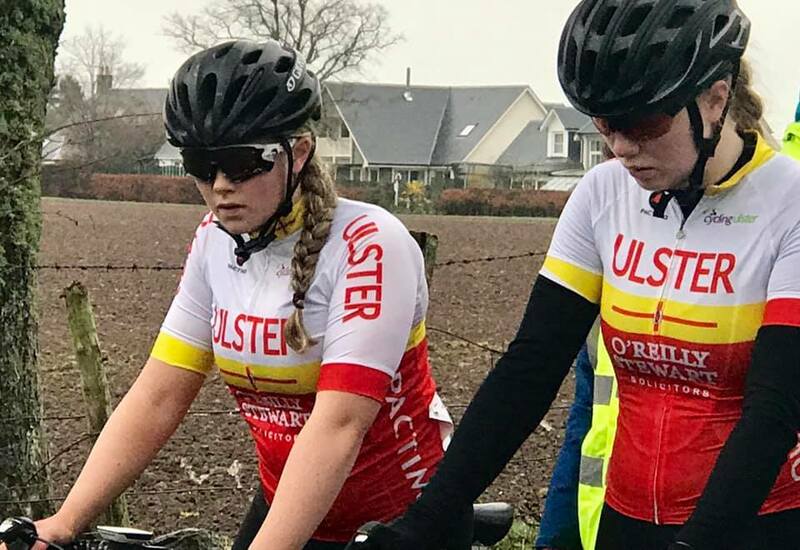 With 80 starters and 20 x 4 rider teams, the experience alone for the Ulster girls was a daunting task considering that they are used to fields a lot less than 80 riders each week at home. The field was split into small groups after a few laps of the tough circuit, these laps were furnished with Points sprints, Queen of the Hills points and at the finish time bonus for the first 3 over the line. The Ulster girls were caught in some of these splits and despite valiant and strong riding, they had to settle for losing valuable time at the finish line. It was back to the Ulster Camp at the vans for hot drinks, food and dry clothes. Stage 1 – (Boys) With the rain and wind still battering the spectators the U16 boys, were well warmed up and ready to get their first taste in the latest Battle of Britain, our 4 Ulster lads would face not only the latest English Olympic Development squad members riding for their regions, but also the best from Scotland and Wales. It was a pleasure to witness that there were no faint Irish hearts and from the gun, the 4 of them mixed it with the best and were very evident at the front of the 80 rider field. (60km – 38miles). As the same in the girls race the wind, cold and rain paid a big part in its shaping of this race being run at a 26mph average despite the conditions. 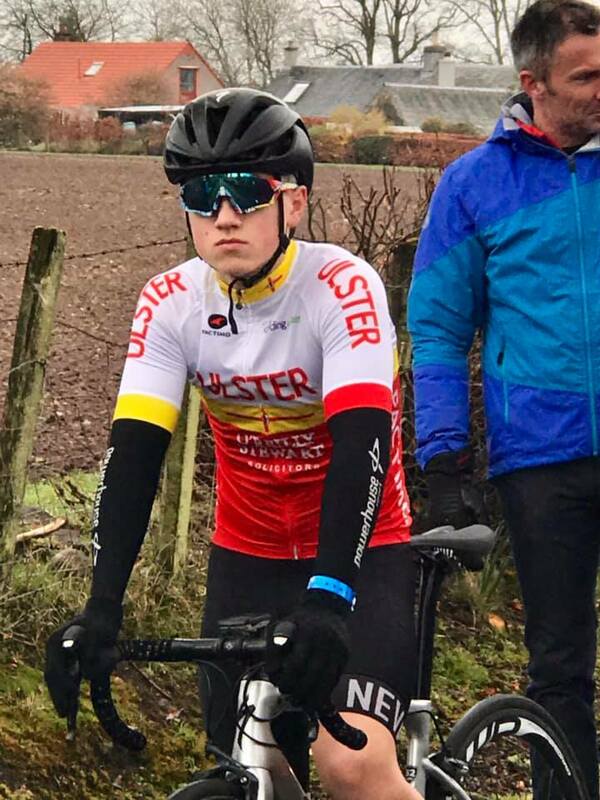 After 4 of the 9 laps covered some of the Ulster riders got caught in splinter bunches that formed into echelons in the crosswinds with Darren Rafferty well placed in what remained of the main bunch. Coming to the line and following relentless attacks and skirmishes a bunch sprint was the obvious outcome. The riders hurtled towards Forteviot at neck break pace and at the line the Ulster rider got 9th place. The events that day saw a great camaraderie being built as the boys and girls bonded and enjoyed their company with words of encouragement, jokes, laughter and a bit of good old fashioned chatting. Stage 2a TTT – (Girls) This was a transit stage with the riders travelling to the sleepy hamlet of Saint David’s for the next 2 stages. First off were the girls and they faced a tough morning with swirling winds and a constant threat of rain. The course was 4.3 miles long and the time was taken off the 3rd finisher. 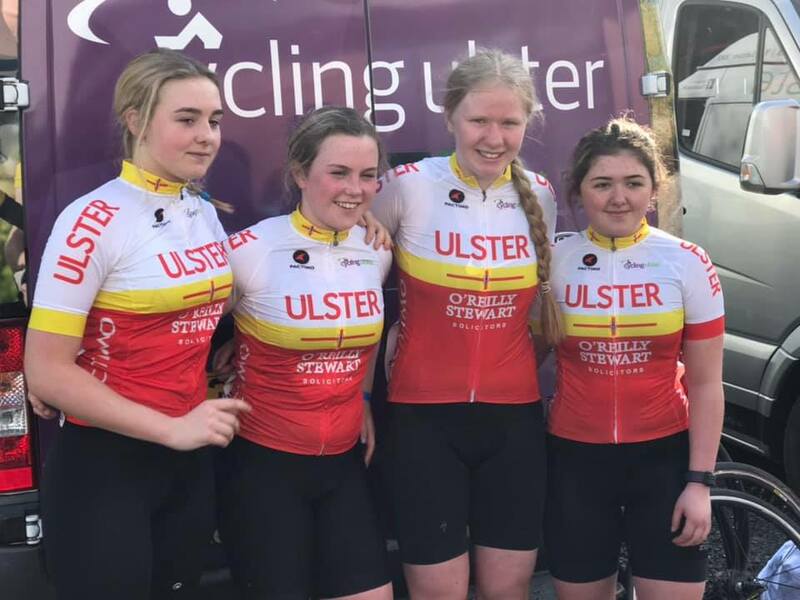 The Cycling Ulster team of Erin Creighton, Rachel White, Katie Neill and Maria McAllister returned a time of 10.48 and were just over sixty seconds down on the Wales team with the flying Backstedt driving them on. The Ulster girls were in the top 10 of the 20 teams following the TTT. The girls equalled their Ulster counterparts time of 2018 and were faster than the 2017 time. Stage 2a TTT – (Boys) Pumped and ready to go the Ulster Boys team of Somhairle Fisher, Joe Owens, Odhran Doogan and stage 1, 9th place finisher Darren Rafferty lined up with an air of confidence, these lads showed a fighting spirit that was evident from leaving home that they weren’t here to make up the numbers but very much to take the fight to the best that England, Scotland and Wales could offer. With a rush of expectation, they sped off and all around the circuit they encouraged each other and coaxed out the best as they crossed the line in a time of 9.06, 23 seconds down on the winning team of British Cycling East Midlands who had 3 Olympic development team riders in their squad. The Ulster riders time despite the tough conditions were the fastest of any Ulster teams in the past 4 years. Stage 3 Road Race – (Girls) With a couple of hours recovery, Doreena, Fiona, Denise and Geraldine made sure everyone was well fed and ready to go in the afternoon’s race (21.4miles). From the go, Zoe Backstedt Team Wales attacked in her new Yellow leader’s jersey and in a short time opened a 20-second gap. It was as if the bunch did not expect this level of aggression and as they faltered going into lap 2 of 5 the gap went up to 54 seconds. When the hammer eventually went down the bunch started to fragment and Ulster’s Erin Creighton was in the hunt with the remains of the peloton. 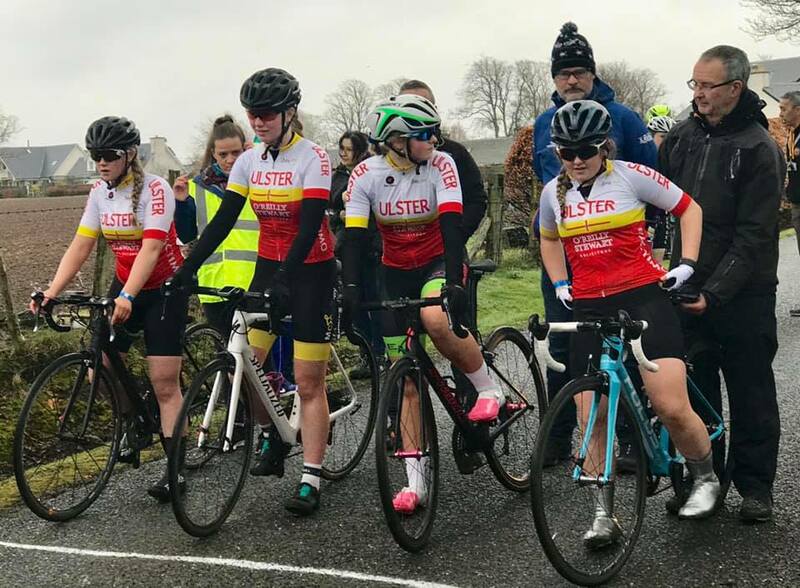 The other three Ulster girls rode strongly with Katie Neill in a chasing group, Rachel White and Maria McAllister being hindered by a mechanical problem and a crash. Into the final lap and at the line Backstedt was 57 seconds clear of Ulster’s girl Erin Creighton who was a 5th place finisher. The Girls and Boys team morale was running high with Darren and Erin getting a 9th and a 5th in two days. 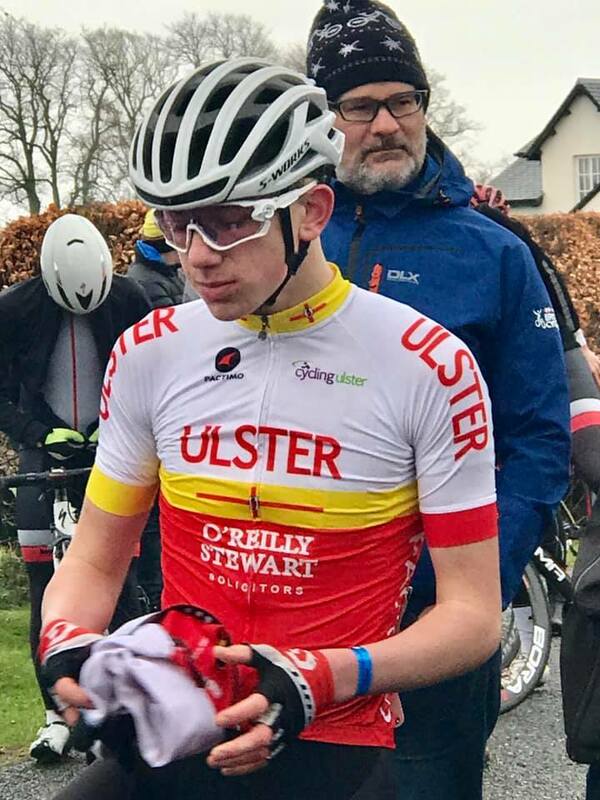 Stage 3 Road Race – (Boys)The plan for the boys was a simple one, well it seemed simple but not everything goes exactly to plan with chosen Ulster potential stage winner Odhran Doogan being shunted out of the way by the stage winner from British Cycling North East Team. Odhran had to settle for a good top 20 placing. This was something that some of the girls and some of the boys learned very quickly that in this level of racing you need to be thick skinned and determined to fight for your position on the road, and the odd elbow can be felt in the ribs to help you make your mind up about moving. In the bunch, Somhairle Fisher and Darren Rafferty along with Odhran and Joe Owens were in the action from the gun with the lads not afraid to announce that they had very much arrived to race. With 11 laps to cover the attacks were relentless and the sustained pressure saw crashes and mechanicals playing a big part with Boys yellow jersey holder dropping his chain and was left to get it sorted on his own. The four Ulster riders all finished and with one stage to go, it was all proving to be a very worthwhile trip to Perthshire. 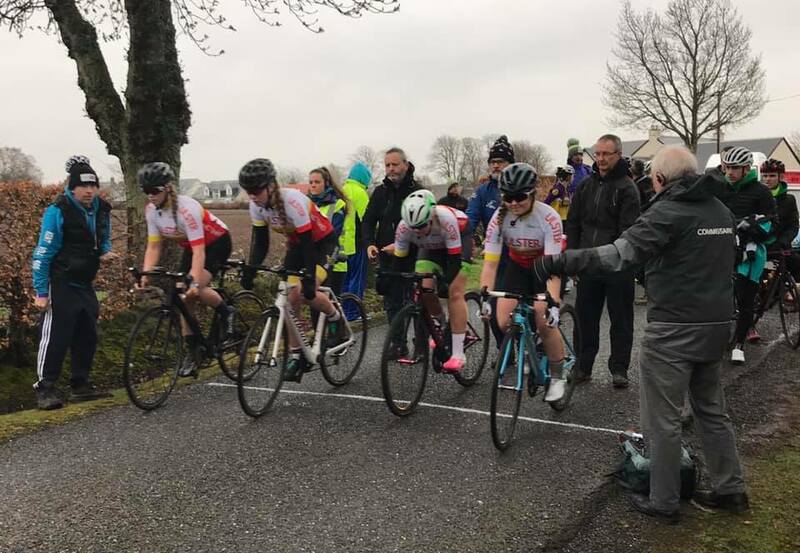 Stage 4 Final Kermesse – (Girls) The morning started as did the other 3 mornings with Gary, Maurice, Doreena and David up from 6 am to get the bikes, kit and bottles sorted for this final race. The riders and race staff assembled at 7 am for breakfast in the school canteen in the historical Strathallan complex. This stage was in the grounds of the school and featured just about every surface and challenge that could be thrown at the riders, potholes, gravel paths, speed bumps, sketchy corners, asphalt smooth parts and a brute of a climb that the girls had to negotiate on their way to the start-finish line. 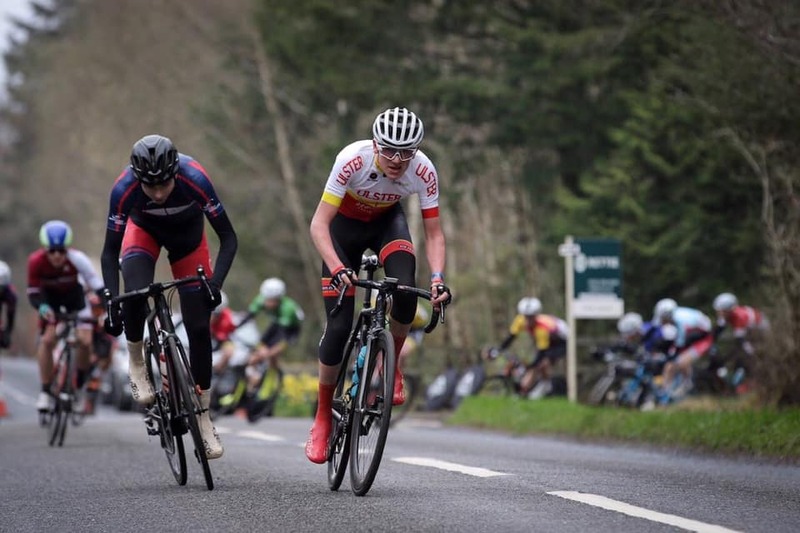 15.5 miles and 10 times up this lung-searing climb it was business as usual with yellow jersey rider Zoe Backstedt attacked on the first lap, breaking clear and rode solo to the finish with 2 minutes 37 seconds to spare at the line. All 4 Ulster girls rode very well with Maria being unfortunate and were taken down in a crash but up she got and with no fuss set about chasing all the way to the finish. Rachel with the repairs done to her bike from stage 3 showed that she was getting more confidence and was along with Katie and Erin who were chasing the fast moving Backstedt along with the other top riders. 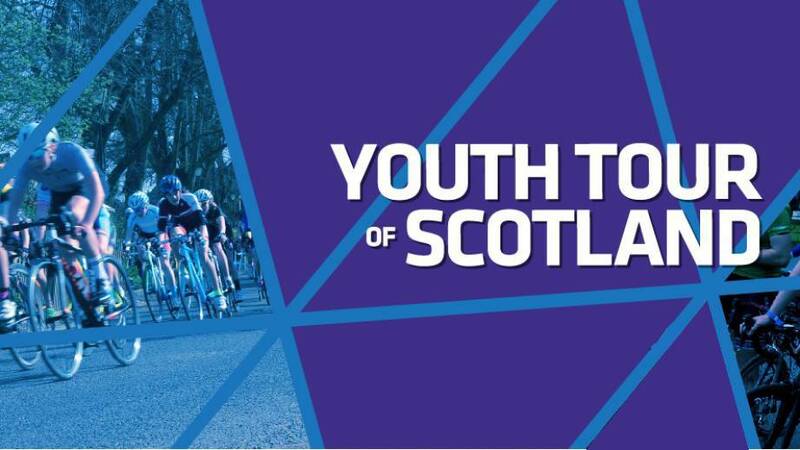 The last laps saw the field disintegrate and there were riders all over the place and the Ulster girls got caught in these splits and all of them finished the Youth Tour of Scotland. Stage 4 Final Kermesse – (Boys) In the glorious sunshine it was an upbeat 4 Ulster lads who lined up to face 16 times up this sticky climb and 25 miles of hard racing lay ahead. The top 20 on GC were grided to the front and the rest straining behind them to get at it. Lap one and the pace was over 30mph and all 4 Ulster lads were to the front. With only 1 second from the Yellow Jersey to the 2nd place, it was well set for a real tussle for the top step of the podium. Lap 5 saw the first break go of 4 riders including the polka dot mountains rider and eventual race winner Joe Kiely British Cycling Eastern. The front of the remnants of the main bunch now reduced to around 20 from the 80 starters. Darren Rafferty the Ulster rider was to the front attacking and trying to get across to the 4 escapees, in lap 10 a small group of 5 including Ulster’s Rafferty left the peloton and with the front now down to 3 it was going to be tight at the line. Odhran Doogan and Somhairle Fisher were in a chasing group as was Ulster’s Joe Owens. At the bell only 12 seconds covered the 9 riders, the front 3 now down to two and the polka dot was now in yellow as the jersey was well back in the disintegrated peloton. 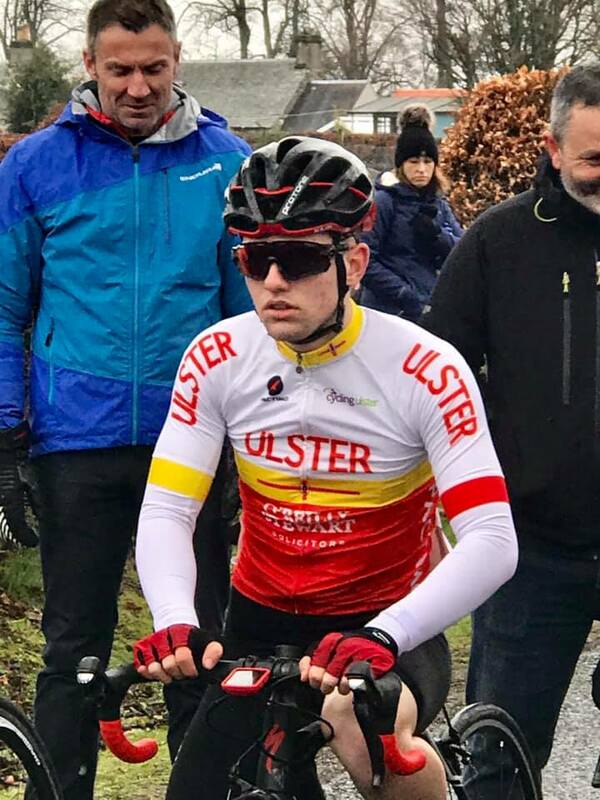 The Ulster necks and heads strained at the top of the climb and it was a tight push for the line with the Ulster rider getting 5th place and moved up to 8th overall in GC. A good warm down, a lot of smiling and cheery faces and the Ulster squad said …heir see you agains… and it was off to get the boat back home. Everyone safe, well looked after and a shed load of experience gained from the trip to Scotland.